In the past few decades, the field of Museum Studies has seen the emergence of a reflexive and often ethnographic interest in cultural and political controversies that often ignite in the course of assembling a collection, mounting an exhibition or planning a new museum altogether. This trend has unfolded both on the museum-based, practice-oriented side of the profession, as well as on the university-based, theory-oriented, side. Curiously, those wishing to bring this trend into a syllabus via an edited volume will find themselves limited to Steve Dubin’s Displays of Power (NYU Press, 2001) or Michael Kammen’s Visual Shock (Vintage, 2007). 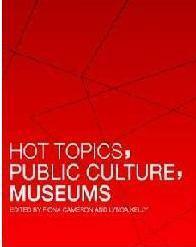 Given this situation, scholars and professionals alike will welcome Hot Topics, Public Culture, Museums (2010) edited by Fiona Cameron & Lynda Kelly, a new volume exploring various aspects of museum controversy resulting from the findings of two research projects: Exhibitions as Contested Sites, the Roles of Museums in Contemporary Societies, funded by the Australian Research Council, and Contested Sites Canada, funded by the Canadian Museum Association). As Cameron notes, controversies have became more frequent in the past twenty years as “taboo subjects, revisionist histories and political issues” entered the museum with more frequency, and as groups seeking arenas to contest long-standing claims about nation, race, gender, and government policy have seized upon various topics hitherto perceived as settled. For the museum scholars, this combination has led to a general unsettling of core definitions on which the field has rested. Controversies, in other words, do not just unsettle audiences or institutions within the context of specific topics, but bring new urgency to reconstruct “the museum idea itself” (Cameron, p, 6) in light of contemporary understandings of complex society. Accordingly, Hot Topics has been organized into two sections: eight more theoretical chapters, exploring the idea of the museum through various philosophical modelings of complex society, and eight more empirical chapters, examining various pathways for engaging museum audiences. As if to prefigure Part I, Caleb Williams’ fascinating chapter, walks the reader through eight different museum models, including a “post-modern crisis model,” “emancipatory museum model,” and “curatorial psychology model.” Fiona Cameron reads Ulrich Beck’s notion of a “global risk society” as an opening to redefining the museum as locations focused on engaging, not avoiding controversy. Richard Sandell and Stuart Frost consider the topics of sexuality and sexual identity by critical evaluation of the heteronormativity underpinning history of museum representation, with an eye towards rebuilding more inclusive museum future. Where Part I of the volume walks the reader through a wide range of theoretical perspectives, Part 2 focuses grounds the discussion in an equally broad range of empirical contexts. Linda Kelley considers the role of narrative and socio-cultural convention in engaging audiences to the Australian Museum on the difficult subject of death. Paul Williams explores the moral impetus of memorial museums by placing them in the context of media and tourism in the new global economy. Juan Salazar tracks the role of new social media in crafting science-citizen networks and their impact on museum representations of climate change. Initially, Hot Topics will offer more of a resource for researchers looking to expand their empirical breadth of museum controversies than to theoreticians looking for an overarching theoretical toolkit for framing new questions. Much of the theoretical starting points are just that: points of entry, most often not quite realized enough to offer guidance beyond individual case studies. As a whole, however, the book gives the student and professional of museum studies alike ample bibliographical references to run with the subject. And as more students turn to controversy as a way of organizing museum material in an age of dissipating definitions, Hot Topics is well-worth mining. Hopefully, it will inspire more researchers and professionals to expand this fascinating and growing aspect of the field.